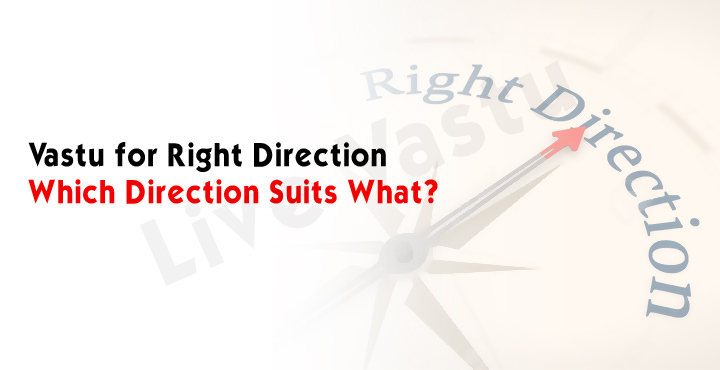 Vaastu for right direction- Which direction suits what? To get your vaastu absolutely right, you have to understand the implications of the east and the west. East is the direction of sunrise. The sun purifies, cleanses and energizes the entire universe. That’s why, the east stands for prosperity and fulfillment. Always keep the east open, ventilate, light and clean. Openings in the east bring in a lot of solar energy, which has therapeutic properties. To reap the benefits of solar energy, let there be maximum openings along the east wall of your household. Do not construct washrooms or shoe rooms in the east, as these contaminate the incoming solar energy. The east side is best suited for positioning puja rooms, study rooms and conference rooms. Use light pastel shades in leaf green and cream on the eastern walls. Try to face east while working or watching television. Use dark shades such as violet and gray on the western walls to suit the dark nature of this direction. Ideally, locate bedrooms, leisure rooms, rest rooms, family sit outs and washrooms in the west of your property. Constructing a kitchen in the west is neither prosperous nor pious. Read more about vaastu for kitchen. The west is ideal for positioning overhead water tanks as lord Varun, the owner of this direction, symbolizes water. Underground water tanks, borings and swimming pools are not considered auspicious. If located in the west. Western walls should be strong to bar subtle energies from flowing out. The stronger the walls in the west, the happier you will be west, the happier you will be. The main gate of your house should never be in west or even the southwest, for that they bring ill luck to you and your family. Do not hang mirrors on the western wall. Hang family pictures instead to receive god energies instead. Extensions in the west are not good they create delays in your life.